Brought in with only two weeks notice, new sailing times from May 22 2017 affect all sailings between the Welsh and Irish ports. From Fishguard, the 2:30 night sailing now leaves at 23:45, and the afternoon 14:30 ferry now sails at 13:10. The morning sailing from Rosslare now berths at Fishguard at 11:15 (previously 12:30), and the night sailing berths at Fishguard at 21:25 (previously 00:30). 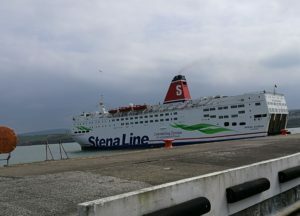 Whether or not these changes will please Stena’s customers (and it is not easy to meet the diverse needs of foot passengers, drivers, and international freight), the impact on Fishguard will be dramatic. Until May 2017, the interchange between trains and ferries in both directions was seamless. A train brought passengers to all sailings, and a train was ready to meet passengers off all ships. But no longer. The 21:25 evening arrival from Ireland is met by a new train that leaves at 22:14. But this train goes no further than Carmarthen. Unless passengers from Ireland have business there, expect a long cold overnight wait for the first morning train east. For years, the night train from Fishguard has taken travellers overnight all the way to London, and now it has simply disappeared. In its place, a new 22:14 service abandons you in Carmarthen. Another loss is the removal of the 17:40 service from Cardiff, changing at Clarbeston Road – we know it as the Sardine Express. It has simply disappeared. A further change is the loss of the express mid-morning through service from Cardiff to Fishguard. In its place, you catch a 10:04 from Cardiff, but have to change at Swansea for a new Fishguard service arriving at 12:30. There are further detailed changes to services throughout the day to and from Fishguard. Overall, our service of seven trains a day each way is now cut back to six. Were we ever asked? The news is not all bad for rail travellers. replacing the 17:40 service from Cardiff, a new service leaves the capital at 19:04, changing at Carmarthen to reach Fishguard Harbour at 22:02. This may be welcome news for travellers wanting a later departure from London or Cardiff, but still arriving before midnight. What is astonishing is that these changes are driven by Stena, a private ferry company, but will impact rail travellers across Wales, without any consultation or debate. Fishguard Trains suspects that Arriva was caught seriously off guard by Stena’s news, and may try to do something to restore services later in 2017. But this is no way to plan and run an international rail-sail link. As we have covered in the past, this is a link between two European regions, and subject to European laws meant to protect the integrity of international travel. 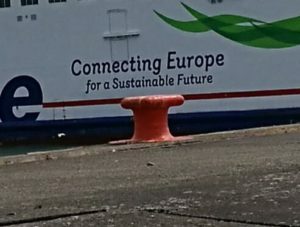 Has Brexit emboldened Stena to ignore the European dimension? For us, the worry is that the disruption of passenger links between Ireland and Wales through Fishguard (and inevitable reduction of rail passenger numbers) will undermine Wales’ ability to compete in future, when Northern Ireland becomes the favoured route for traffic between the Irish republic and the UK – a prospect that already concerns Welsh Government. Bad news for Fishguard, and bad news for Wales. Fishguard Trains hears a whisper that Arriva is still playing catch-up with Stena’s disruptive new timetable. 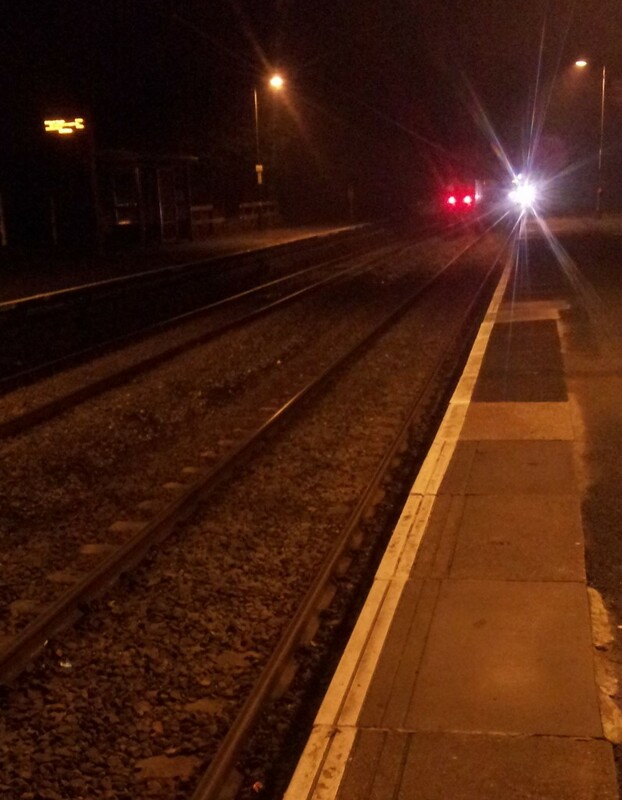 It may be that the 22:14 train from Fishguard that meets passengers off the Rosslare ferry (that now berths at 21:25) is to be extended from its unhelpful terminus at Carmarthen – but only as far as Swansea. At least they are going in the right direction. More news when it reaches the end of the line. One more push, and Arriva might make it to Pyle. Did someone want Paddington? That’s so last century. 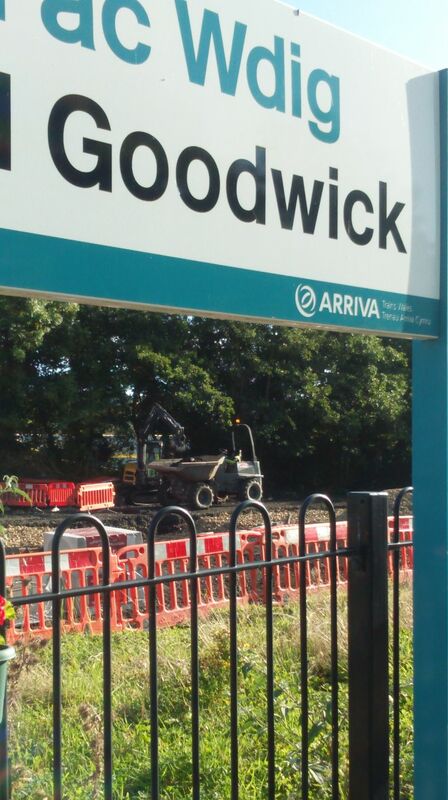 All the way from Swansea to London, works to electrify the main line are appearing. Pylons to carry the overhead wires are going up, and the depots at Swansea, Bristol Parkway and Reading already have a near-complete overhead installation. Pylon foundations for the overhead gantries have recently appeared between Cardiff and Newport, as well as right across southern England to London. Right now, only three European countries are without a single kilometre of electric railway – Moldova, Albania and Wales. When they switch on the Swansea depot, Wales will finally lose that unenviable status. Nearer home, and on a more humble scale, works to double the size of the car park at Fishguard and Goodwick are well under way. More parking for park-and-ride travellers, more lighting, and even toilets are appearing. What better testimony to the success of Fishguard’s revived rail service! So travel east of Newport (Gwent) at your own risk. Fishguard Trains thinks this is absurd. London is a common destination for Fishguard passengers. One ticket policy applies to half the journey, and the opposite policy to the other half. The train operating companies need to get their act together. The national rail strike is off – but can you travel east from Fishguard this Spring Bank Holiday evening? Visitors to Fishguard for the bank holiday are wondering if they can get home despite the cancelled strike. 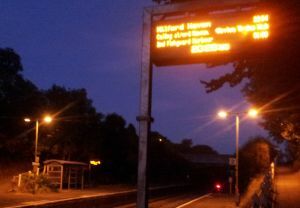 The problem: National Rail Enquiries shows that on Spring Bank Holiday evening, the only train from Fishguard that connects to Cardiff, Bristol and Crewe is running seven minutes later than timetabled, at 19:18 instead of 19:11 from Fishguard and Goodwick. The result is a missed connection at Clarbeston Road. The Fishguard train is due at Clarbeston at 19:37, two minutes AFTER the train from Milford to Cardiff leaves at 19:35. This is nonsense for two reasons: There’s no point running the shuttle from Fishguard to connect with the long distance train at Clarbeston, but then timing it so it misses the connection by two minutes. Second reason it’s nonsense: the set up of points, signals and single line working at Clarbeston means it is impossible for two eastbound trains to follow each other at only two minutes interval. So what’s going on? Fishguard Trains asked Arriva Trains Wales. They checked and told us “you’ve caught us out good and proper on this one. We didn’t rejig”. Somehow train times had been amended in light of the impending strike, but not put back after its cancellation. They’re doing that job now, thanks to our query. But what time should passengers be at the station in Fishguard? Arriva advises “Be at the Harbour or Fishguard and Goodwick at the normal time” – that’s 19:08 from Fishguard Harbour, 19:11 from Fishguard and Goodwick. Are you Mr B Davies? 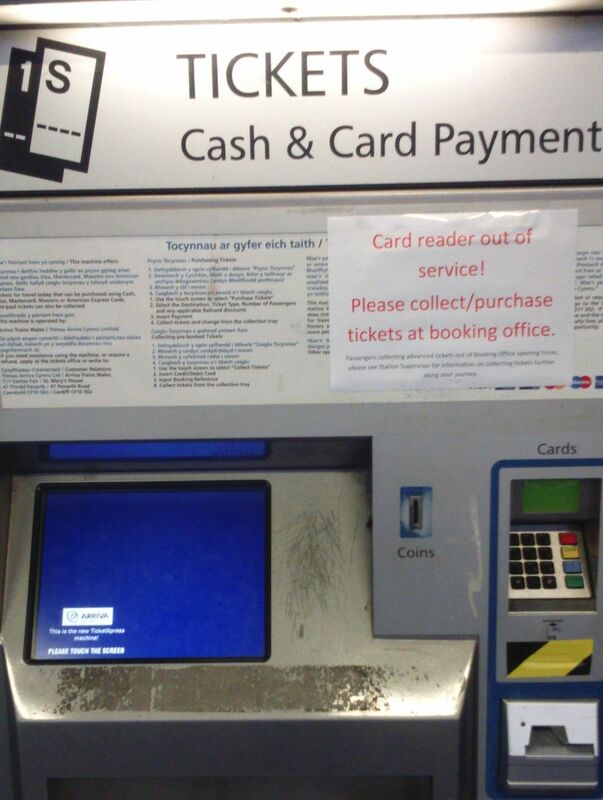 Did you recently buy a ticket from Cardiff to Fishguard, but forgot to remove it from the ticket machine at Haverfordwest? If so, this is for you. Found: Railway Ticket! It’s a long shot, but I have found a rail ticket for Cardiff to Fishguard on 14th April for a Mr B Davies (who I presume will be unable to travel without it). It must have been left at the Haverfordwest ticket machine, as I picked it up with the tickets I collected there on Saturday. Thanks Helen, kind of you. So, Mr Davies, if this is you, please get in touch one way or other, and we’ll see what we can do. By the way, isn’t it about time Fishguard had a ticket machine? Then when we want to buy Advance tickets, we don’t have a 30 mile round trip to Haverfordwest just to pick them up (or fail to pick them up). Or is that not in your long term plan, Arriva Trains Wales? Fishguard’s winter 2015 rail timetable does more than fine-tune the times of our seven trains a day. It has nearly lost one of our seven precious eastbound services. The 19:11 from Fishguard and Goodwick is the only train after lunchtime that connects anywhere east of Swansea. By changing at Clarbeston Road, you can get as far as Cardiff, Bristol, Hereford, Shrewsbury and Crewe. But the winter timetable introduced a fatal flaw: the time at Clarbeston Road between arrival of the shuttle from Fishguard and departure of the Milford to Cardiff train is cut to four minutes. And that, according to Network Rail, is a missed connection. As a result, online rail enquiries show no service from Fishguard to anywhere east of Carmarthen in the evening. You will search in vain for a train from Fishguard to anywhere other than Clarbeston Road. (And, lovely place though it is, who wants to go to Clarbeston Road for the evening?) Neither can you buy an Advance ticket from Fishguard to eastward destinations for the 19:11. It simply doesn’t exist. Is this just a ticketing problem? Surely the service itself is good? The 19:11 runs from Fishguard not to serve Clarbeston Road, but to connect to the long-distance eastbound train at Clarbeston Road, and to make good the Welsh Government promise of seven trains a day each way for Fishguard. So is this a guaranteed service, even with a four minute change? Fishguard Trains frequently takes the 19:11 to Cardiff, Bristol and points east. We have often wondered what would happen if it was seriously delayed. A night on the platform at Clarbeston Road? Would the signalman bring us a cup of tea? This week we had a chance to find out. The train was late coming in to Fishguard (“points trouble at Cardiff”) and by the time it had turned around it was ten minutes late leaving Fishguard and Goodwick. Fishguard Trains’ reporter was already hoping the signalman would have enough tea bags. But then, step forward Rob Ware, the Carmarthen-based guard on the 19:11. He explained that if the connection was missed, a taxi would be organised to get me to Cardiff, in time for my final connection to Bristol. That sounded extravagant but welcome. Then having waited for a mobile signal, he called the Clarbeston Road signalbox. Yes, they would try to hold the Milford train, as long as ours was not too late. As the Fishguard shuttle slowed down for the signalbox, there was the Milford train, held up, awaiting our arrival. Thanks Rob. The next concern was a problematic ten minute connection at Cardiff for the Bristol train. The Milford train was now thirteen minutes late leaving But the extra minutes built in to timetables here and there worked in our favour, and the Milford-Cardiff train reached Cardiff three minutes early, having made up 16 minutes on the journey. Thanks to Rob Ware, and the Clarbeston Road signalman, what might have been a nightmare journey turned out well. Fishguard Trains thinks the four minute timetabled change at Clarbeston Road is simply a missed connection waiting to happen. The tight timing seems pointless: the incoming service is timetabled in to Fishguard Harbour at 18:51. Instead of waiting till 19:08, it could be timetabled out at 19:00, restoring the broken ticketing links, restoring our seven daily trains, and reducing everyone’s stress. Every weekday seven trains leave Fishguard and Goodwick eastbound to Clarbeston Road and the rest of the world. Here’s a quick guide to what each train is good for. What use is a train that runs when normal people are asleep? You might be surprised. 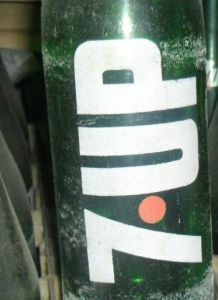 Off on holiday? If you have an early flight, this could be just your ticket. Arrive in Cardiff at 5:01 where you change for Cardiff Airport arr 6:11, Bristol Airport arr 8:20, Heathrow (via Reading Railair coach) arr 8:25; Manchester Airport arr 9:04, Birmingham International arr 8:20. Save on overnight accommodation and sleep on the plane. This is your early start if you must be in Carmarthen by 8, Swansea by 9, Cardiff by 10 or London by midday. Long distance train direct to Manchester. This train will get you to Carmarthen for 9, Swansea for 10 and Cardiff for 11. It is also our morning long distance train. Stay on board to reach Manchester by 14:15. Change there for Glasgow, arr 18:01 and Edinburgh arr 18:22. Maybe you don’t often want to go to Scotland (but has there ever been a better time?). But how good is this – breakfast in Fishguard, lunch in Manchester, dinner in Glasgow or Edinburgh. And just one change. This train was retimed in winter 2014 to leave Fishguard and reach Carmarthen a few minutes earlier at 8:43. At Carmarthen it waits on Platform One for 17 minutes – enough time to pop in the café for a snack. This gets you to Carmarthen by 11, Swansea by 12 and Cardiff by 1pm. This is our daily fast train to Cardiff. Running non-stop from Llanelli to Bridgend, it points the way to a future high-speed network serving south and west Wales. Fishguard to central Cardiff in under 2.5 hours is good going. This is the last daily service that connects to Swansea, Cardiff and eastwards as far as Bristol and Crewe (but not London or Manchester). Our last evening train, reaches Carmarthen before 10pm and connects to Swansea before midnight. When’s the train? Remember ten to the hour. It’s easy to remember that five of our seven eastbound trains leave at 50-something – ten to the hour. To catch the train, be at Fishguard and Goodwick at 10 to 2, 10 to 7, 10 to 8, 10 to 10 and 10 to 9 in the evening. The only exceptions are the lunchtime 13:32 and the evening 19:11. If you can choose when to travel and don’t want to change, the 7:53 and 13:32 are for you. They both take you through to Cardiff, and the 7:53 on to Manchester. On the 6:50 and 19:11 you change at Clarbeston Road. On the 9:57 and 20:53 you change at Carmarthen. On the 1:53 you change at Swansea. Changing at Clarbeston Road, you stay on the same platform. Bad news about changing at Clarbeston Road: the only facility is a shelter. Good news: we have not heard of any travellers being stranded there. The next train has always arrived. You’ll let us know if that’s not so. You can reach almost every corner of Britain, and large parts of Ireland, France, Belgium and the Netherlands by same day trains from Fishguard, often with only one or two changes. With three branch lines and sixteen stations in Pembrokeshire, you’d think it was easy to travel around our county by rail, but it isn’t. Fishguard to Haverfordwest would be good, but the line doesn’t connect – take the bus! But there are good connections between Fishguard and Tenby/Pembroke, by changing at Whitland. Take the Fishguard and Goodwick dep 7:53, Tenby arr 9:43; or the Fishguard and Goodwick dep 9:57, Tenby arr 11:49. To return the 17:38 from Tenby connects at Whitland with the train to Fishguard and Goodwick arr 18:46. Always buy Advance tickets for the best prices, but leave enough time for them to arrive by free post. 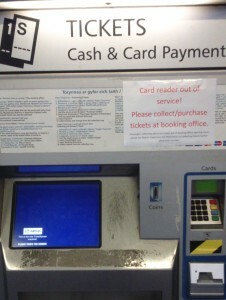 That’s why we need a ticket machine or office in Fishguard. At Fishguard and Goodwick, sit on the left for the best sea views between Carmarthen and Gowerton. Valley Lines and South Wales Main Line will be electrified, and the two governments have settled their funding dispute. Now it’s full speed ahead for Wales’ first ever rail electrification. Splendid news, and credit to new Welsh Secretary Pembrokeshire MP Stephen Crabb for prioritising solutions over disputes. It promises the best possible future for public transport throughout south-east Wales. And that is despite some media commentators finding no better way of explaining the benefits of electrification than shaving ten minutes off the Cardiff to Merthyr and Treherbert times. It is so much more than that. The winter timetable from Fishguard is going to add about 15 minutes to the journey to Swansea and beyond. The 06.47 first train will lead to a long wait of 17 minutes at Clarbeston Road for the Milford service; is the shelter there good enough for such a wait in winter weather? The second train, moved forward to 07.50 is going to sit in Carmarthen station for 17 minutes before moving on, on the old timetable. This is going to discourage use of these trains. All this to satisfy a whim at Cardiff about getting commuters to Carmarthen. Fishguard is getting a very raw deal; is a journey time of THREE HOURS to Cardiff acceptable – 37 mph average speed? I think this is one to shout from the roof tops and to Stephen Crabb. Do you agree that this is a whim from Arriva’s Cardiff head office? Do you support prioritising local commuter traffic between Fishguard and Carmarthen over long-distance travellers? With only seven trains a day each way, timetabling is always going to be a juggle of compromises. 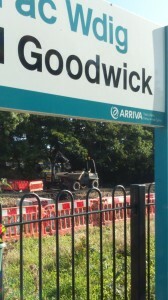 Has Arriva got this one right or wrong? If ten minutes less is such good news for Merthyr, is ten minutes more equally bad news for Fishguard? Let’s hear your views, and we’ll make sure Stephen Crabb does – though with the franchise renewal now in Welsh hands, perhaps this is one for Carwyn. The 20:30 will shortly leave platform 2 for Fishguard. But the departure is displayed on NEITHER train indicator board – not the one on platform 2, and not even the wrong one on platform 1. Spad asks the conductor on the 18:04 from Cardiff to Milford if he will make any announcements about changing at Clarbeston for Fishguard? “Oh yes, I always do” he assures us. Sadly there are no announcements until the train finally pulls into Clarbeston Road. There have been none since the train left Cardiff either. Another passenger from Cardiff, mistakenly gets off the train with his bike, expecting – wrongly – to change for Fishguard. Three hours later he cycles into Fishguard. 1 When a train is scheduled to depart, a platform display of that service, time and destination is required – in every case. 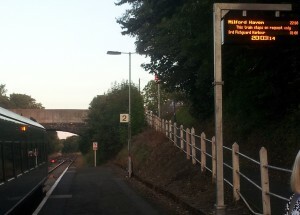 2 All station platform indicators that show a Milford service that offers a change at Clarbeston Road for Fishguard should say so. 3 On-train indicators that display and announce forthcoming stations also to announce changing at Clarbeston for Fishguard. 4 Conductors to make announcements about changing at Clarbeston Road from Cardiff onwards, not only after Carmarthen, and certainly not only as the train arrives at Clarbeston. 5 All the endless warnings that Clarbeston Road is a request stop to be accompanied with information about changing for Fishguard. Can you manage that, Arriva Trains Wales (Ten Years of Service / Deg Mlynedd o Wasanaeth)? 20:03 at Clarbeston Road. The train pulls in to the platform, ready for the 20:05 departure to Fishguard – our last train of the day. And as ever, the platform indicator ignores this train, displaying instead the following 22:10 to Milford Haven. This happens every time we change at Clarbeston for the last train to Fishguard. It happened to Irishman (see his recent comment), and no doubt it has happened to you too. Now here’s the photographic evidence. Add this to Arriva’s continuing failure to provide timely information to westbound travllers about changing at Clarbeston for the late Fishguard train, and you wonder how passengers still manage to negotiate the information blackout to make it to Fishguard. We are not impressed. But then, some people are never satisfied. The three-year trial of increased rail services to Fishguard has ended in success. Welsh Government today announced that the service is to be extended to the end of Arriva’s franchise in 2018. Transport Minister, Edwina Hart, has given the go-ahead to continue with the additional rail services between Fishguard and Carmarthen following a review of the three-year experimental service introduced in 2011. Feedback from the local community, passengers and business on the extra five return services has been positive and research shows these additional services have brought economic and social benefits. The Minister has now agreed to extend the service until the end of the current franchise in 2018. All stations in Pembrokeshire served by the services have experienced increased usage, with passenger numbers to Fishguard, Goodwick and Fishguard Harbour stations doubling since the introduction of the additional trains in 2011. More than 60 per cent of passengers surveyed said they would not have been able to make their intended journey without the additional services. Businesses reported that the extra trains helped attract visitors to the area which saw increased usage of the coastal path and ferries to and from Ireland. “The North Pembrokeshire Transport forum is truly delighted that the enhanced train service to Fishguard and Goodwick is to continue. We are grateful to have been given the opportunity to demonstrate the positive benefits to the local economy and community that the additional trains have provided over the past three years.